Every technological advancement seems to have a sharp inflection point, a time before which it seems like any early adopters are considered kooks, but beyond which the device or service quickly becomes so mainstream that non-adopters become the kooky ones. Take cell phones, for example – I clearly remember a news report back in the 1990s about some manufacturers crazy idea to put a digital camera in a phone. Seemingly minutes later, you couldn’t buy a phone without a camera. It seems like we may be nearing a similar inflection point with a technology far more complex and potentially far more life-altering than cameras in cell phones: powered exoskeletons. With increasing numbers of news stories covering advancements in exoskeletal assistants for the elderly, therapeutic applications for those suffering from spinal cord injuries and neurodegenerative diseases, and penetration into the workplace – including the battlefield – as amplifiers of human effort, it’s worth taking a look at where we are with exoskeletons before seeing someone using one in public becomes so commonplace as to go unnoticed. Prosthetic and assistive technologies have come have come a long way in recent years. When there are not only major medical research organizations, but individuals getting on board designing tools to improve the lives of others? That’s something special. Enter a homebrew essay into this field: ExoArm. Attached to the body via what was available — in this case, the support harness for a gas-powered weed-eater — which distributes the load across the upper body and an Arduino for a brain, ExoArm designer [Kristjan Berce] has since faced roadblocks with muscle sensors meant to enable more instinctive control. So — for now — functionality is limited to a simple up and down motion controlled by two switches. It is worth noting that the down switch is currently mounted in such a way that when the user moves their arm down, the ExoArm follows suit, so there is some natural feel to using the arm in its present iteration. ALS robbed one of [C. Niggel]’s relative’s of the use of their upper body. This effectively imprisoned them in their house; ALS is bad stuff. Unfortunately too, the loss of upper body mobility meant that they couldn’t even use the computer to interact with people and the outside world. However, one day [C. Niggel] noted that the relative’s new electric wheelchair was foot controlled. Could this be adapted to a computer mouse? He looked up commercial solutions and found them not only prohibitively expensive, but also fraught with proprietary drivers and all sorts of bad design nonsense. With all of the tools out there today there was no reason this couldn’t be quickly prototyped and sent to the relative in need. He used a combination of conductive thread, neoprene, and velostat to build the pads themselves. The pads were balanced with some adjusting resistors in series. The signals are sent to an Adafruit Feather board which interprets them and converts it to a PS/2 standard. The first version of the mouse used separate pads glued to a MDF board with contact cement. However this, along with some other initial design flaws, resulted in premature failure of the mouse. [C. Niggel] quickly returned to the lab and produced a new version with more robust construction and mailed it off. So far so good! Say Watt? A Talking Multimeter? After a request from one of his friends, [Mastro Gippo] managed to put together a talking multimeter to be used by blind persons working in electronics. He wanted a feature-rich meter that had serial output, and recalling this Hackaday article from a few years back led him to find a DT-4000ZC on eBay, which has serial output on a 3.5mm jack. (Though, he actually recommends this knockoff version which comes with excellent documentation). It turns out there aren’t many talking meter options available other than this expensive one and a couple of discontinued alternatives. [Mastro Gippo] needed to start from scratch with the voice synthesizer, which proved to be as easy as recording a bunch of numbers and packing them onto an SD card to be read by an Arduino running the SimpleSDAudio library. He found a small, battery-powered external speaker used for rocking out with music on cell phones and hooked it up to the build, stuffing all the electronics into an aluminum case. Stick around after the jump for a quick video of the finished product! [Jan] works with both physically and mentally disabled individuals, some of whom cannot read, making many of their tasks more difficult. Although [Jan] is not in a position to teach reading or writing skills, he was able to build an add-on device for the scales used in repackaging sweets to provide simple feedback that the user can interpret. The device has three LEDs—red, green, and yellow—to indicate the package does not weigh enough (red), weighs too much (yellow), or lies within an acceptable range (green). The industrial scales at [Jan’s] workplace each have a serial output to connect to a printer, which he used to send data to the device. An ATMega8 controls the lights and an attached LCD, with the usual trimpot to change the display’s contrast and a rotary encoder to adjust the device’s settings. Everything fits snugly into a custom-made frosted acrylic enclosure, laser-cut at a local hackerspace. [Jan] provides a rigorous guide to approaching each step on his Instructables page, along with source code and several pictures. See a video overview below, then enjoy another scale hack: building one from scratch. [Ricky] absolutely loves watching DVDs. He is epileptic and is cognitively functioning at a level roughly that of a 6 year old. His younger brother [Ronnie] noticed that [Ricky’s] DVDs as well as his DVD player never lasted very long due to some rough handling. [Ronnie] stepped up to make [Ricky’s] life just a little bit easier by building this super rugged DVD watching station. He started by ripping out the front pcb of the DVD player that has all the buttons. [Ricky] can wear through a set of standard buttons in no time, so [Ronnie] extended these to arcade buttons. 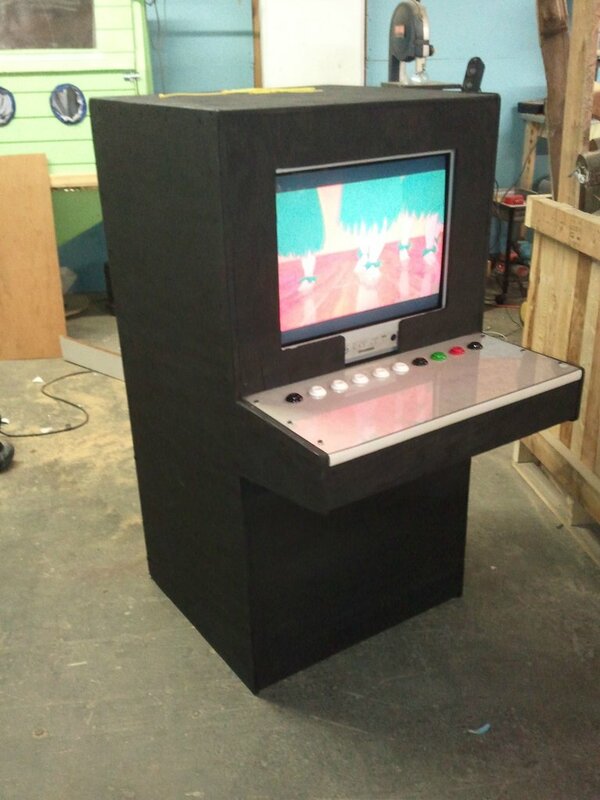 Then he mounted everything into a custom cabinet that can withstand a considerable amount of abuse. Now they can load 5 disks in and [Ricky] can watch what he pleases without worry of destroying the player. [Ronnie] mentioned that he’d like to make a more complex control system using some kind of microcontroller, but frankly I find the simplicity of this to be perfect. Maybe a media pc loaded with movies might be a decent next step. You can see [Ronnie’s] build log here. If you’ve ever considered making something like this to improve someone’s life, you should check out thecontrollerproject.com where people with special needs can connect with people who can build interfaces. This device was developed for a girl that has cerebral palsy and can’t control her arms or legs effectively. In order to interact with the world more effectively to play board games and the like, this system was developed. The PixBoard scans an 8×8 matrix of LEDs allowing her to select the piece to be moved and where to move it. This is done using only simple buttons and the processor’s timer.